No matter how bad the Seahawks were the past two seasons, they could still count on two things. A win against the Rams, and a second win against the Rams. 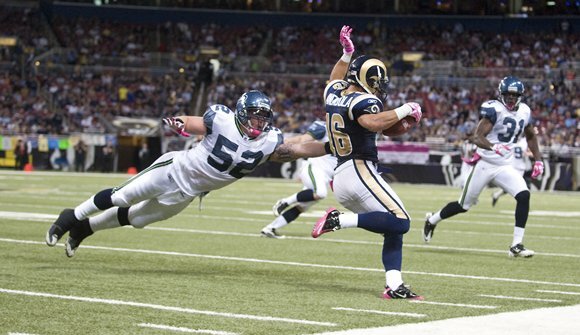 There weren’t even any scheduling errors that allowed Seattle to play St. Louis twice at home. Their success was so great that the Hawks were winning on the Rams’ home turf. St. Louis made a statement this Sunday. No longer will they be that team. After having the first or second pick in the draft for three years in a row, I guess you could say it’s about time. Personally, I didn’t think we’d see this kind of change during Bradford’s rookie year. If Hasselbeck is still the best quarterback in the NFC, we didn’t see it today, and I think it’s obvious now who will hold that distinction in the near future. As big as a game can be in week four, this could have been a huge week for the Hawks. A win would have allowed the Seahawks to go into their bye week at the top of their division. Instead, a loss puts some momentum behind the Rams with the division up for grabs by any team in the NFC West. There was speculation that the Rams locker room ran out of ice in an effort to soothe the bruised hands of their defensive linemen after Matt Hasselbeck did a spectacular job at repeatedly throwing right into them. If he could have hit a receiver in the end zone half as many times as he had passes tipped, it would have been a record shattering day. It wasn’t as though it was all Hasselbeck who contributed to the poor offensive showing. From running the wrong routes and dropped passes that hit the receivers in the hands, to a subpar showing by the offensive line and previously mentioned tipped passes, it was a number of issues that kept the Hawks from putting much offense on the board in the first half. The first half could have gone better had Seattle gotten into the end zone rather than stalled at the 2-yard line to start the second quarter. Tack on two failed fourth down attempts that could have been field goals, and Seattle may have had the lead going in at halftime. But things also could have been much worse if not for a timely Earl Thomas interception in the end zone to counter a tipped pass intercepted by the Rams only a few plays prior. Despite the 10 points the Rams put up, the defense actually played fairly well in the first half as Seattle was able to get some good pressure on Bradford. I wouldn’t throw up any alarm flags because of this loss though. Don’t the experts who decide the betting lines consider home field advantage to be about 17 points? Unless my assumption on that is wrong, Seattle actually played well enough for a draw. As bad as this loss may have felt for us Seahawk fans, there were two losses in the division that were far worse. After tying up the game at 7-7 with a defensive fumble return, the Cardinals were acting as though they had a chance to win in San Diego. Instead, the Chargers went on to score 34 unanswered points before the Cardinals kicked a 53-yard field goal. I’m sure Cardinals Coach Ken Whisenhunt wouldn’t hesitate to trade his quarterback questions for the one’s Coach Carroll is getting about Matt. The mother of all losses this week goes to the 49ers. Up 14-13 with only about 90 seconds left in the game, it looked like San Francisco had secured their first win of the season in Atlanta when Nate Clements intercepted Matt Ryan. Instead of taking the ball out of bounds and sending Alex Smith out to kneel down for three plays, Clements was stripped from behind at the 7-yard line. The Falcons proceeded to drive about 70 yards to kick a game winning 43-yard field goal to win 16-14. Oh, so close, San Francisco. The great thing is that Seattle has a chance to regain the division lead by simply sitting idle in week five. Either that or St. Louis could surge right to the front by going into Detroit and winning on the road. Even with the Saints just barely squeaking by their opponents, surely the Cardinals will fall at home to New Orleans. Going back to their house, San Francisco probably has the best chance to win of the bunch since Michael Vick will likely sit out this week for the Eagles. As I said after the first week, Seattle is still my favorite to win the division. Arizona certainly won’t be winning a division as long as Derek Anderson is their quarterback. Since the Rams haven’t even combined to win more than eight games over the past four years, they still have to prove they know how to win consistently. Fortunately, the team that is probably the most talented in the NFC West is sitting winless at the bottom of the division. Considering they’re still only two games back, it’s a little scary that they might have a shot for a comeback.